By Dan Ambrose: Welterweight champion Errol Spence Jr (24-0, 21 KOs). says he wants to fight Saul Canelo Alvarez in the near future, and he’s predicting a victory for him over IBO/WBA/WBC middleweight champion Gennady ‘GGG’ Golovkin (38-0-1, 34 KOs) this Saturday. Spence will move up two weight divisions to fight Canelo when the time comes for them to face each other. Golden Boy Promotions executive Bernard Hopkins likes the idea that Spence wants to fight Canelo, because this means that he thinks that he’s going to beat Golovkin on Saturday. Hopkins doesn’t need to speculate whether Spence thinks Canelo will beat Golovkin, because he openly admits it. Spence clearly favors Canelo to beat Golovkin. The good news is Spence won’t have to wait long to find out if his prediction is correct. If Canelo can’t get the job done this Saturday, then it would be the second time he’s failed to beat Golovkin. Canelo was seen as the loser in the first fight. His two positive tests for clenbuterol last February didn’t help his popularity much, which takes away a lot of the credit that he previously was given for his first fight with GGG. Since testing positive for clenbuterol, Canelo is seen as a drug cheat by a lot of boxing fans. Spence, 5’9 ½”, is taller than the 5’8” Canelo and has a two inch reach advantage over him. 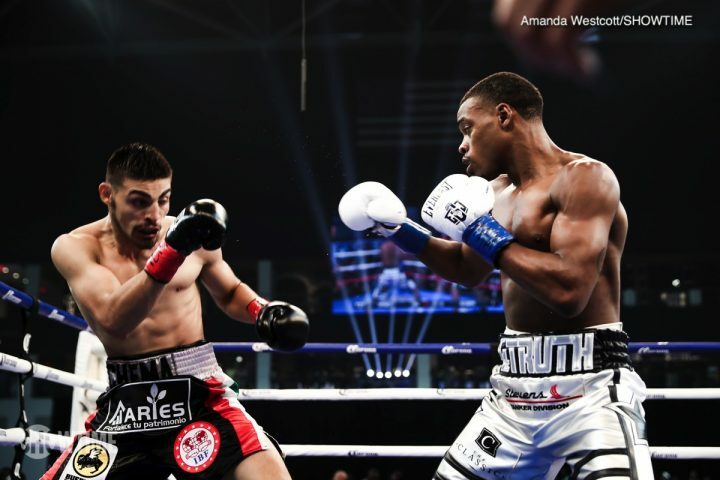 Spence could fight at junior middleweight if he wished, because he’s got the size to fight in that weight class and he regularly spars against World Boxing Council junior middleweight champion Jermell Charlo. Canelo Alvarez is basically a pumped up junior middleweight. Spence would have the size to beat Canelo. It would be a mistake if Golden Boy lets Canelo fight Spence though because it could be the end of his stardom if he loses to him and to Golovkin in the rematch on Saturday. Whether Spence could win a decision against him is the big question. With the judging that worked the Canelo-GGG fight last year, it might be difficult for Spence to beat Canelo. Spence has the power to take the judges out of the equation in a fight with a knockout. Spence, 28, is a worse style match-up for Canelo than Golovkin is, considering that he’s more willing to fight at close range and throw body shots. Golovkin fought Canelo on the outside, which isn’t a good way to beat him due to his popularity. It’s not because Canelo isn’t vulnerable in being out-boxed by longer armed fighters that jab him. It’s simply not easy to beat Canelo by a decision. Some boxing fans believe the major reason for that is Canelo’s popular rather than what he’s doing inside the ring. Canelo arguably lost to Golovkin in their first fight, and he also appeared to lose to Erislandy Lara and Austin Trout. “That means Errol Spence believes Canelo can beat GGG,” Bernard Hopkins said to Fighthype. “Errol Spence will be a problem with anybody he steps in the ring with. Errol Spence to me is the Sugar Ray Leonard of this era. Errol Spence is only going to get better,” Hopkins said. Spence doesn’t need to say good stuff about Canelo for him to one day get a fight against him. Spence has a good chance of getting a fight against Canelo as long as he keeps winning. It’s a fight that might even be doable in 2019 if the two of them continue win. Spence can’t see the future. If he obviously believes that Canelo deserved a loss in the first fight with GGG by the way he talks about his stamina problems. It doesn’t matter what Spence believes. If Canelo can’t do a better job in the rematch against Golovkin on Saturday, then he’s going to come up the loser. A bad loss for Canelo will put him in a situation where he needs to make a decision whether it’s wise for him to stick it out at 154. Canelo’s lack of size for the middleweight division may doom his future. “I think he’ll beat him,” Spence said in predicting Canelo will beat Golovkin in their rematch on Saturday. “The last fight, he [Canelo] got a little tired. If he gets rid of his stamina issues, and if he’s in shape for 12 rounds, I think he’ll win. In the first four or five rounds, he was out-boxing him and looking good, but then he fatigued later in the fight. So if he’s in shape, he’ll win. I think he did better standing his ground. I think he’ll stand his ground a little bit more, and just slip punches and counter punch off it. GGG hit him with some hard shots, but Canelo took the shots well. I think Canelo can take his shots. I think he hurt GGG a couple of times too. I think they can hurt each other,” Spence said. If Canelo listens to Spence’s advice about standing his ground against Golovkin, then it could end early for him. That would be the worst advice for Canelo to follow with him looking as small as he is right now. He doesn’t have the size to fight like that against GGG now that he’s trimmed down. If Canelo doesn’t have the size to go to war with Golovkin, then the fight is going to end badly for him if he stands his ground. Canelo needs to fight the way he did last time he fought GGG, which is to move a lot, and fight with his back against the ropes. However, fighting on the ropes will be harder for Canelo this time because Golovkin is almost surely going to attack him this time to make sure the judges don’t rob him. Spence should be trying to fight Terence Crawford first before he starts talking about wanting to fight Canelo. Spence hasn’t shown that he’s the best at 147 year. He still needs to beat Shawn Porter, Keith Thurman and Crawford before he gets to the level of fighting Canelo.